It’s always good to keep your PC update, it help keep your PC safer and running smoothly. There are so many app are available which helps you to update your PC easily and keep it safe. Today here we will discuss about portable and reliable app Patch My PC. 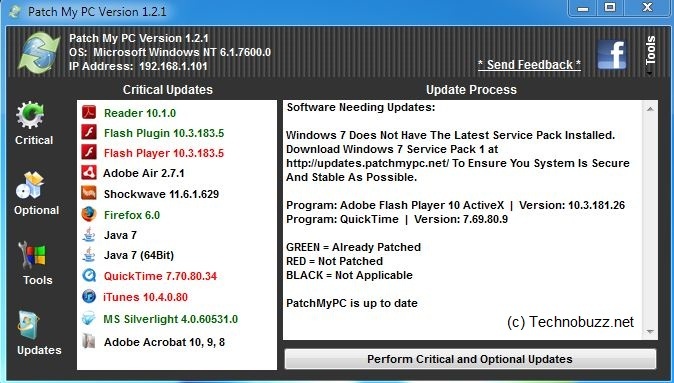 Patch My PC is new and free app which help you to update your PC with simple and easy steps. The app is designed to check your system against the current versions of Adobe Reader, Adobe Acrobat, Adobe Flash, Mozilla Firefox, Oracle Java, Apple Quicktime and more. Just Download the app and run it, than it will scan for outdated software automatically. If software is outdated it will show as Red, if it’s updated it will show as Green, and if it’s not installed it will show as black. And yes there are many optional updates that can be installed with PatchMyPC. Optional updates can be installed by checking the checkbox in the optional software panel. Offers many optional software you can include in the update process. Shorcuts to many common Windows Tools. Can scan your computer to see if any Windows Updates are needed.